Taking storytelling into the next dimenison. We're a community of authors, artists, poets, coders, world builders, and musicians exploring the future of storytelling at our virtual writer's colony. So please, create and account on the Join Nook page. Log in to explore our library, writer club house, information center and the community art gallery. Explore all of our user's regions. Check out the events page for monthly events where you'll be sure to meet our residents. If you need help finding anything contact one of the Nook Admin Team listed below. 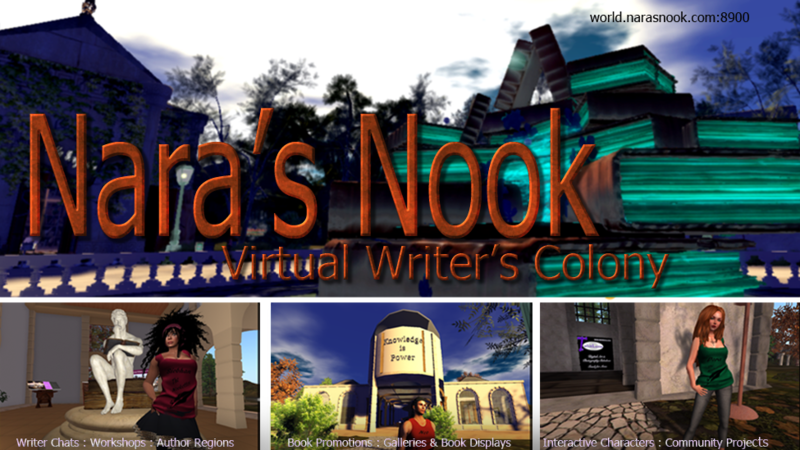 Nara, the founder of Nara's Nook, is a real-world author, virtual-world explorer, game writer, poet, environmentalist, and lover of all things creative or geeky. She hopes you’ll take the time to explore Nook. We have so much to share with you! Contact me if you need help. Growing up she was the dreamer in her family, something not always thought of as a positive thing. As a child she would draw and build stories around her pictures, so writing was a natural extension for her. When not writing she spends her time between oil painting and reading. She favors writing paranormal, urban fantasy, time travel, and fantasy romances. She loves developing dark, edgy heroes and heroines who overcome impossible odds internal and external. She considers herself a “hopeful” romantic who believes in a healthy relationship built on respect and a strong partnership. For her, this is the key to a happy ever after. Siobhan Muir is a bestselling author of paranormal romance and romantic suspense, and the host of #ThursThreads flashfiction challenge. She’s taught flashfiction as an interactive storytelling technique in virtual worlds and as an exercise for better novel writing. E. Twinklens is a 3D modeler, photographer, and digital artist. Jeweler, coder, mesh artist and Linux wizard.